with Chief Information Officer Josh Nacol. 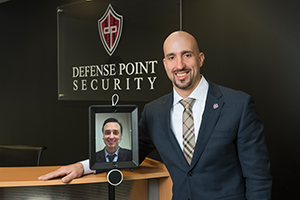 Defense Point Security and the hit television show “The Big Bang Theory” have something in common: mobile virtual-presence robots. “We’ve taken a unique approach to our corporate culture by creating virtual connection cameras – virtual presence robots – at both of our offices in Herndon and Alexandria,” says company CEO George McKenzie. The company’s services range from security engineering to incident response. One of its specialties is digital media analysis (computer forensics), which provides timely information to help determine whether a security incident has occurred. The growing company last year ranked No. 1 among small businesses in the Best Places to Work in Virginia. This year it is the top-ranked company among midsize businesses. Customers include the Centers for Medicaid & Medicare Services and the Department of Homeland Security. Defense Point opened an office in Chandler, Ariz., in 2014 to support Immigrations and Customs Enforcement (ICE). As the company grew, he and his partners decided to try outsourcing some recruiting in an attempt to score more candidates. But they soon realized that outsourcing was not feasible. “We have a rigorous recruiting process, and they don’t have the same drive and understanding so we brought it back in-house,” McKenzie says. The company ranked No. 1,291 on the 2015 Inc. 5000 list of fastest-growing private companies in the U.S with a three-year growth of 323 percent. Defense Point also was listed in Washington Business Journal’s 50 Fastest-Growing Companies and as one of the Washingtonian’s 50 Best Places to Work. The firm pays 100 percent of the premium for medical insurance for employees and their families. Other benefits include additional paternity and maternity leave, an in-house gym, 24-hour access to the company’s computer lab area, which is open seven days a week, and free LifeLock, a service that monitors credit cards and credit scores. As part of its ongoing training, Defense Point holds study groups for a variety of certifications, including Certified Information Systems Security Professional (CISSP), Certified Ethical Hacker (CEH) and Program Management Professional (PMP).